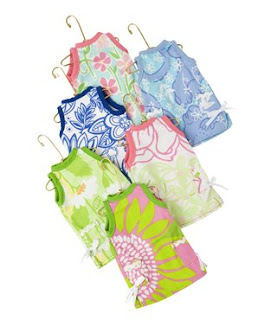 Nautical by Nature: Lilly Oh Shift ornaments on SALE! oooh ooooh ooooh! might have to buy 'em now! thanks for the heads up! Ooohhhh they are so cute! I might have to grab some now for next year! I usually have to think about things. . . but I went directly over and ordered a set!! There are only 7 left now!!! Thanks! Thank you, thank you, a thousand thank yous for posting this! We plumb forgot about ordering them Miss Kate! Happy, Happy, Wonderful New Year to you! I paid full price :( , but they were worth it! I almost don't want to take down my tree because I'll have to put them away! Oh, I saw these yesterday and was so excited! They are TOO cute! Thanks for the info & Happy New Year to you as well! Those are charming! I might have to invest is some for my future tree! Ahh.. those are so cute! Thanks for the price update! I had to jump on that price! I got these last year. It's nice to see they've put out some new prints. I just had to add them to my collection. They are just to cool to put away till next Christmas. I have to find a place for them year round!